Although not someone who targets personal glory, Hatters striker Danny Hylton admitted he does have one eye on reaching 30 goals in what has been a superb debut season for the club. The summer signing from Oxford United bagged his 26th from the penalty spot at Mansfield on Easter Monday, coolly dinking his attempt over Stags keeper Jake Kean from 12 yards. I’m delighted to get to 26 and will try and add a few more, but it’s about the team and the achievement we want to achieve this season. Should he reach 30, he would become the first Luton player to do so in the Football League since Tony Thorpe managed it back in the 1996-97 campaign, when he went on to notch 31 times. On whether he was looking at achieving such a feat, Hylton said: “Yes, of course, I won’t put too much pressure on myself, 30’s the next milestone though, so I’ll just keep going along. “There’s three more games and then the play-offs, so six games to get four goals will be nice. 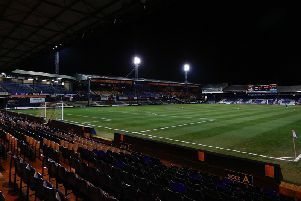 Hylton has the maximum of six games to do it, with Luton now looking to win promotion through the play-offs, after the top three spots were finally put out of reach yesterday. The striker may not play a part in all of Town’s remaining fixtures though as he is currently on 13 bookings for the season, with two more leading to a three game ban. Hylton came close to seeing his name written in referee Mark Brown’s notebook at the One Call Stadium after being left bemused at a number of decisions that didn’t go Town’s way. He said: “A few baffled me they really did. “One, when he gave a free kick against me with their centre half because I ‘made a movement towards the ball and then didn’t go for it and the centre half missed the ball’. I still don’t understand the decision, how that’s a free kick? I really don’t. “But he’s the referee and they make decisions. I get frustrated at times but you can’t shout and scream, like maybe I did a few times today, you’ve got to keep your cool and carry on. “The manager and coaches have had a word with me, tried to change that and get the referees on side rather than against me. Town did benefit from one decision in their favour from Brown, with George Taft penalised for a clear handball after Hylton tried to flick the ball over him inside the area. However, the striker felt his side should have been awarded another spotkick in the first half too when Pelly-Ruddock Mpanzu’s shot appeared to strike Rhys Bennett’s hand. Hylton added: “Again, obvious. He (Brown) said that he was too close to Pelly, but if his hand’s not there it’s got a chance of going in. “It was an obvious penalty for me, he didn’t give it, but thankfully he gave the one second half. Boss Nathan Jones did admit that they will have to consider resting their leading talisman if and when their play-off place is secured, adding: “Danny’s on a knife-edge every single game he plays, that’s Danny Hylton.